« Chile Today, Hot Tamales! Happy New Year and welcome to a brand new decade! I, for one am very excited to greet the New Year with optimism and hope, and look forward to our pending culinary adventures that await us this year, like the Saborea Festival in Puerto Rico, and the South Beach Food and Wine Festival in Miami next month. 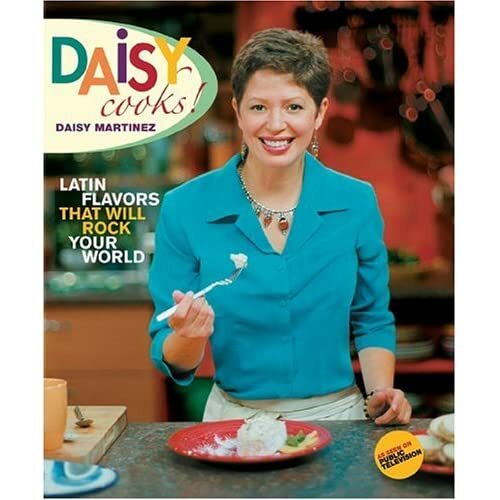 Team Daisy is also feverishly working for the release of my new book, “Daisy: Morning, Noon, and Night” (Atria) which will be launched at the SOBE Festival as well! Here in New York City, we celebrated a White Christmas and New Year, and if that is any indication, we are looking at a challenging winter, but I say, bring it on! January is going to be a month of cozy sancochos, crispy empanadas, and freshly baked desserts that fill my home (and yours!) with the fragrance of comfort. This is what I call “in the kitchen” weather, and if you know me, that’s my favorite place in the house, where I receive all of my inspiration. For this reason, this month’s recipes will include Biche de Pescado, an Equadorian fish stew that is heartbreakingly delicious, laced with a touch of coconut milk and peanut butter. I am going to pair this with Sweet Plantain and Raisin Empanadas, and wrap the menu up with Chilean Sandwich Cookies, and trust me, if this meal doesn’t have you out of you chair and dancing in the kitchen, you need to get yourself to and Emergency Room STAT!! My family and I sent 2009 off by celebrating with a dinner that I conjured up in my comfy kitchen, starting the meal off with a champagne toast to love, health and joy for the New Year. The rest of the menu consisted of a Jumbo Shrimp Salad with a Deconstructed Guacamole, a Truffled Lobster Risotto, and Herb Crusted Roast Rack of Lamb with Veggie “Spaghetti” (for pictures, visit my Facebook page), but the real highlight of the evening was our dessert course, because I got to christen my new fondue pot, where I made a Chocolate Rum Fondue where dipped pineapple, ladyfingers, strawberries, raspberries and marshmallows. I also provided some chopped salted peanuts, shredded coconut, and toffee bits for garnish. Needless to saw, it was the hit of our send-off dinner! While popular in the 1960’s, fondue is happily making a comeback, and I have jumped on that bandwagon to promote the movement. In fact, I actually made gifts of fondue sets this Christmas to two of my very good friends, and have gotten rave reviews about them! Whether sweet or savory, fondue is great ways to include your guests in the making of the meal, not to mention promote great dining conversation! So whether it’s a slowly simmered stew or a fabulous fondue, I hope that 2010 is full of delicious meals shared with family and friends, and enjoyed with continued good health. 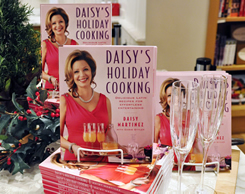 I look forward to seeing and meeting many of you this year at the different festivals and during my book tour, and wish you a very Happy New Year!